Thanks to all who entered. I do appreciate your time and dedication. The winner is Xmas Dolly. Guess what we had for dinner today? Ooh and we have leftovers num num num! You know leftovers usually taste a whole lot better right? :) Or at least it seems that way because all the seasonings have settled into the dish. Betty Crocker Suddenly Pasta Salad (Greek)! MyBlogSpark sent me this prize pack with a sample of the newest variety Suddenly Salad Greek, a storage container, a serving bowl and an insulated tote. I love this huge bag. I will collect all the bags I can get since I'm hearing news of plastic being banned all together in some states. So pasta it was for dinner. I admit that I added a bit more pasta to stretch for the whole family. I also made chicken and diced and mixed it in with stir fry vegetables. YUMMMY! Pasta is my go-to food when I'm tired, lazy or just don't know what to cook. It doesn't mean it has to be boring right? So sizzle it up with a package of Suddenly Salad! It was really easy to do! And the kids love the different colors. With Betty Crocker Suddenly Salad mixes, you can whip up a unique and delicious side dish in the time it takes to boil pasta. Each box of Suddenly Salad comes with ready-to-cook pasta and a seasoning packet. Put your own spin on it by adding your choice of mix-ins to create a one-of-a-kind pasta salad. 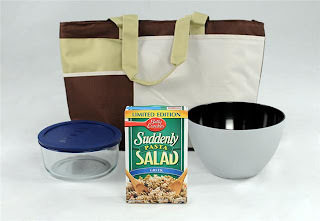 For great recipe ideas and to learn about the different varieties of Betty Crocker Suddenly Salad mixes, visit www.SuddenlySalad.com. There, you’ll find great recipes, including one for Greek Tossed Pasta Salad, using Suddenly Salad Caesar pasta salad mix, and Garden Ranch Pasta Salad, using Suddenly Salad ranch & bacon pasta salad mix. Check out the Greek Tossed Pasta Salad. I can't wait to do that one. Betty Crocker through MyBlogSpark is offering one of my readers the same prize pack that I received! Exciting huh! The newest variety Suddenly Salad Greek, a storage container, a serving bowl and an insulated tote. What kind of dish do you usually bring to a picnic? We take baked beans or potato salad! Thanks! I usually bring homemade fried chicken or a pasta salad. Like JamericanSpice Facebook page@tcarolinep JessieKatie S.
I tend to take some type of pasta salad or a spinach dip. I usually bring a dessert. i usually bring sandwiches, macaroni salad, and salad. Italian Salad, but sometimes I bring deviled eggs. I like to bring pasta salad and Sandwiches.